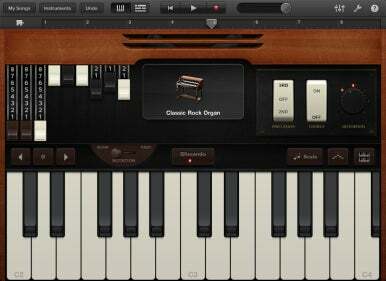 GarageBand is a tool for making music, but anyone from musicians to tin-eared newbies can use it, as this iPad app proves. GarageBand ’11, part of Apple’s iLife suite, is a versatile application. With it, you can create musical scores by stringing together audio loops, play and record virtual instruments, record “real” instruments plugged into your Mac, create iPhone ringtones, record and assemble podcasts, create movie soundtracks and play and record your guitar through modelled amps and effects. Wonderful as the Mac-based GarageBand is however, far too many people ignore it completely, or open it once to see what all the fuss is about and never do so again. They do this because GarageBand is perceived as a musician’s tool. 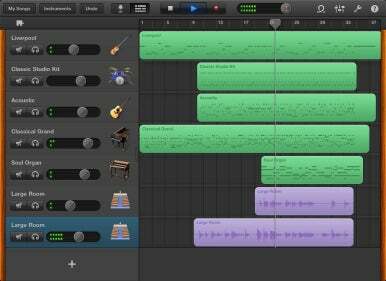 With GarageBand for iPad, Apple is sending a different message: Yes, GarageBand is a tool for making music, but anyone from musicians to tin-eared newbies can use it. No talent required. It underscores this message by eschewing the podcast, ringtone and movie-soundtrack elements and focusing entirely on making it easy to compose music. 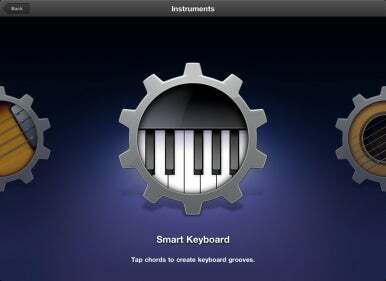 It includes a variety of “smart” instruments that allow you to play pleasing notes, chords and beats on virtual keyboards, guitars, basses and drums without requiring that you have a lick of musical training. That doesn’t make GarageBand for iPad a toy or somehow unworthy of trained musicians. In addition to its smart instruments, this eight-track recorder includes a wide variety of virtual instruments (synthesised and sampled) that you can play and record, lets you record real instruments jacked into a compatible audio interface as well as sounds recorded with the iPad’s microphone or a compatible external mic, includes modelled guitar amps and stompboxes for guitar player, offers a couple of different ways to create drum tracks and even includes a sampler instrument that allows you to use an onscreen keyboard to play back sounds recorded with a microphone. After spending many hours with GarageBand for iPad, my first generation iPad and a few music gadgets, I’m a believer. By the time you finish reading this, you may be too. When you first launch GarageBand for iPad you see an Instruments screen where you swipe through a variety of options including Keyboard, Drums, Smart Drums, Smart Bass, Smart Keyboard, Smart Guitar, Guitar Amp, Audio Recorder and Sampler. Keyboard and Drums are instruments similar to their real world counterparts. To play them, you tap on virtual keys or drums, respectively. Smart Drums, Smart Bass, Smart Keyboard and Smart Guitar are instruments designed so that it’s much easier to hit the “right” notes by tapping chords, pre-programmed patterns or notes limited to a particular scale. Guitar Amp allows you to apply amp and stompbox models to a guitar you’ve jacked into your iPad via a compatible interface. The Audio Recorder instrument is for recording with the iPad’s microphone or a compatible external microphone (or one plugged into a compatible interface). And the Sampler is used to capture and modify sounds recorded via a microphone and play those sounds on a musical keyboard. You start working with GarageBand by choosing an instrument. Do so and you’re taken to an instrument screen. At the top of each instrument screen are standard transport controls that include Go to Beginning, Play/Stop and Record buttons. Nearby is a Master Volume slider for adjusting GarageBand’s overall volume (the iPad’s Volume toggle switch serves the same purpose). Also at the top of the screen there are Mixer and Song Settings buttons that, when tapped, produce menus that you use to control track volume and panning, echo and reverb levels, quantisation setting (designed to improve timing that moves notes to a rhythmic grid so they play on the closest chosen beat, an eighth or sixteenth note, for instance), tempo and key. You can also switch on a metronome and choose to have GarageBand play a four-beat count-in before you record a track. You can choose to record by section (an eight-bar section is enabled by default though you can increase or decrease the number of bars) or, by switching on an Automatic option within the Section menu, you can record a track for as long as you like. When GarageBand reaches the end of a section, it loops back to the beginning and switches from Record to Play mode so you can immediately hear what you’ve just recorded, except for the Drums instrument. When recording a drum track, the playhead returns to the beginning of the track and continues recording, allowing you to build up a drum track by layering sounds on top of each other (called overdubbing). This is a typical feature of real drum sequencers and it’s nice to see it included in GarageBand. Once you’ve recorded something with one of the instruments, a Tracks button appears at the top of that instrument’s screen, indicating that you can now access the Tracks screen. This screen looks very much like the Mac-based GarageBand’s main window. Instrument icons appear in a column on the left side of the screen and tracks appear to the right. You zoom in and out of tracks using pinch and stretch gestures. If you tap an instrument icon and drag to the right, the instrument column expands to reveal mute, solo and volume controls for each track. These same controls are found by selecting a track and tapping the Mixer button at the top of the Tracks screen. Additionally the resulting Mixer menu contains track pan, echo level and reverb level controls for the selected track as well as a Quantisation command and a Master Effects entry that you use to apply echo and reverb to all of your project’s tracks. To contract the instruments column, just drag the right edge to the left. It’s also within this screen that you edit your tracks. Regrettably, you can’t move, delete or add notes when editing tracks. To do this kind of thing you must export your project to iLife’s GarageBand for editing. You can shift tracks forward or back in time by tapping and dragging them. And you can select all or just some of the sections within a track. To trim the end of a track, tap on it to select it and drag the left or right edge. Green tracks, those you record using one of the included instruments, can be trimmed only at the right edge. Although you can trim silence from the beginning of these sections, you can't move the left edge past the beginning of the first note. If you double tap on a track you see Cut, Copy, Delete, Loop and Split commands. The Split command is cleverly implemented. Select it and a Split marker appears within the track. Drag it to where you want to divide your track and drag the marker down, as you would push a knife through butter, and the track splits. Because you can’t move, delete or add notes within tracks, the split command becomes more important for perfecting a track. If you flub a note or passage, split the track at the measure where you’ve made your mistake, return to the instrument by tapping the instrument icon at the top of the screen, place the playhead at the point where you want to begin recording, tap Record and take another crack at recording the portion of the track you’re unhappy with. To add loops, audio snippets included with the app, tap the Loops icon in the Tracks screen. In the Apple Loops menu that appears tap an Instrument entry and choose an instrument type (drums, bass, guitars, synths, strings, mallets, woodwind and vocal, for example). 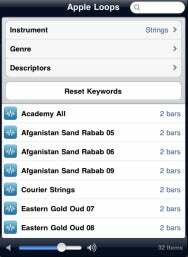 Once you select an instrument you’re taken to the Apple Loops menu where you can narrow your search by Genre (Country, Electronic or Urban, for instance) as well as choose loops by descriptors, keywords such as Single, Clean, Acoustic, Relaxed or Grooving. To audition a loop, just tap on it. To add it to your project, drag it into an empty track. You can then drag other loops into this track, even those that have a different kind of sound. For example, you can place a synth pad app in a track’s first four bars and then a conga track in the next four bars. Much like with iLife’s GarageBand, you can make repeating copies of a loop by tapping on it and dragging the right edge to the right. When you’re happy with your work, tap the My Songs button at the top left corner of the screen and you’re transported to the My Songs screen where you can access all your saved projects. By tapping an Export button, you can choose to send your song to iTunes or email it. When you send your song to iTunes you have the option to export it as an AAC audio file or as a GarageBand file. If you choose the Email Song export option, GarageBand mixes your project as an AAC file and then creates an email message, complete with boilerplate text that lets the world know which app you used to create the attached song. All you need to do is edit the text to your liking, add recipients to the To field and tap Send. To transfer a track to your Mac, attach the iPad to your computer via the sync cable, launch iTunes, select the iPad in iTunes’ Source list, click the Apps tab in iTunes’ main window, and choose the GarageBand entry in the list of apps. Here you’ll find your exported GarageBand files. Drag the file to your Mac’s Desktop and then either double click it to play it in iTunes or, if you’ve saved it as a GarageBand project, open it in iLife’s GarageBand for further tweaking. Note that Apple has not released the updated version of GarageBand that allows import of these files so this is a feature I couldn’t test. Yes, this absolutely is a tiresome way to move tracks, but it’s the regrettable reality of syncing data between an iOS device and a computer. I’d love to see a future update that allows you to wirelessly export projects and songs to MobileMe and Dropbox. Note that while you can import iPad’s GarageBand projects into the Mac’s version of GarageBand to work on them, you can’t do the reverse. Projects you create in iLife’s GarageBand can’t be ported to GarageBand for iPad. Similarly, you can’t import audio tracks to GarageBand. As with iLife’s GarageBand there’s no option to import tracks from your iTunes library, for example.